Manufacture your optimised products with a customised automated production solution that enables highly accurate, consistent and fast production at significantly lower costs and time. Optimised product designs resulting in better performance and higher quality made easy with Software. FEA made accessible with TANIQ's toolbox: Extensively analyse your exact products design. Automated production resulting in significantly faster and more consistent production at lower costs. TANIQ is a Technology R&D specialist developing unique optimisation and automation technology for reinforced rubber product manufacturers. This optimization is based on calculation of optimal cord positions using the Design software. This product design can be imported in an FEA Toolbox for Abaqus to simulate the product performance under different load cases (e.g. Burst pressures, lateral and axial movements, expansion ratios). Finally, the product is manufactured by accurately placing the cords and all other materials, using an high-precision industrial robot. Hence, TANIQ's products consist of Custom design Software - FEA Toolbox - Robotic automation. 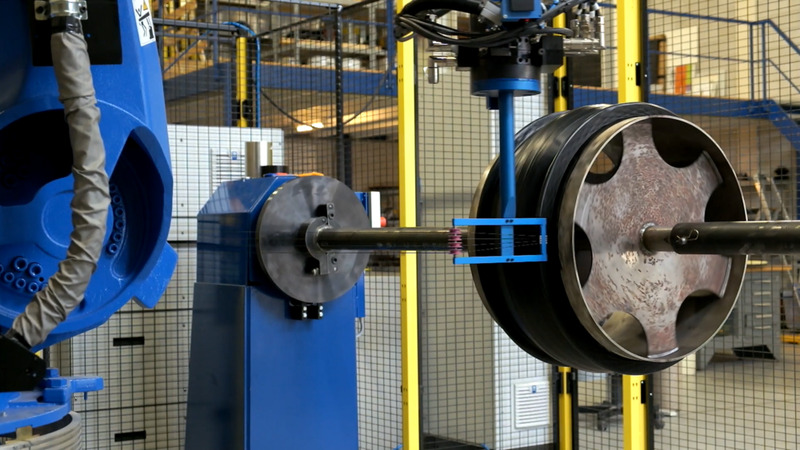 TANIQ's approach to reinforced rubber product optimisation adn automation, uses algorithmic calculation to design products and analyse the stresses within a flexible, cord-reinforced envelope. The system looks at the plane stresses across the surfaces, and throughout each layer within the construction, so that they can optimize the distribution of stresses and hence cord reinforcement layers through the thickness of the product. This processes has been intergated in user-friendly customised Design Software. Once the stress pattern has been calculated and the cord layout designed, TANIQ uses a robotic manufacturing cell to apply the cords and the rubber compound over a mandrel to ensure perfect repeatability and consistency. The same robotic approach applies tapes used to apply pressure to the component during curing. TANIQ's products have been designed and developed parallel. As a result, the design made in the Software based on input parameters ( properties) is uploaded directly to Abaqus for FEA or to the robot for production. 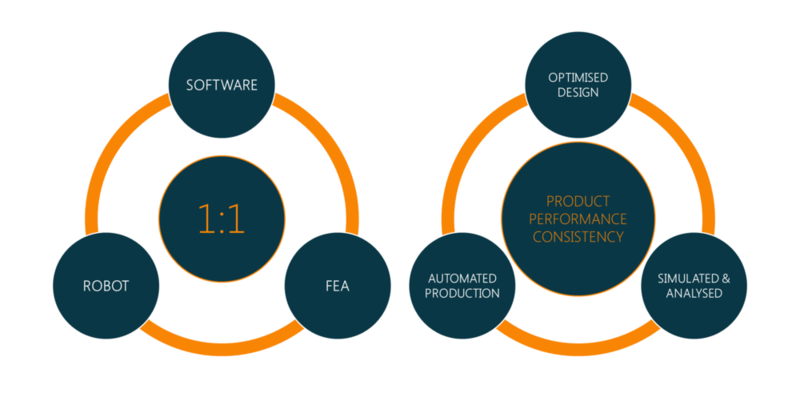 Thereby, TANIQ introduces unique optimisation and automation technology with 1:1 consistency between the product design, the FEA model and the final product. This synergy reduces production and R&D costs and time with first-time-right designs and significantly less prototyping. As a result, the products combined ensure very short lead times from quotation to final product. The technology is designed to be flexible and versatile and can be customised for your application(s). This flexibility continues in operation and enables you to easily and efficiently switch between different products. Historically, the production of reinforced rubber products has been a manual process, relying heavily on skill and extensive experience. This introduces three areas of production risk. Firstly, manual material application can result in inconsistency and inaccurate placement of reinforcements as the operator varies the amount and orientation of the reinforcement-sheets. Secondly, the cords in the sheets cannot correctly be aligned with the stresses, wherefore additional reinforcement material is required. Thirdly, the tapes are not always applied with the same tension. Most important of all, production speed is limited by human capabilities and requires extensive training and product knowledge. All these risks are eliminated using TANIQ's approach. The result of the synergy of TANIQ's products is highly accurate automated production and consistent products. The consistency within the design and production processes also ensures repeatability over time. This means that whenever a product needs to be manufactured at a later stage (days, weeks, months or even years), this product will be identical. Because of the user friendly design software and automated production, the overall production times are significantly shorter (80%) compared to conventional manual processes. As a result, the overall operational and production costs are significantly lower. Therefore, interesting Return On Investment (ROI) periods are typical. The use of a robotic arm in combination with TANIQ's technology and software provide a flexible solution. Meaning that changing to a different product (type, size, specifications, materials, mandrel) is very quick and easy.